From the opening howl of “Jungle Drums,” there’s no doubt that garage rock pioneer Dex Romweber and his sister Sara are back with a vengeance on their new album, Is That You In The Blue? 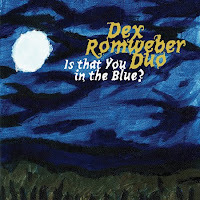 While Dex has been releasing his two-piece rambunctious refrains with The Flat Duo Jets since the mid-80’s, this is only his second album billed as Dex Romweber Duo, following up 2009’s Ruins of Berlin. With Sara pounding away on the drums and Dex’s 1-2 punch of screaming, lo-fi guitar and carnival barker vocals leading the charge, Is That You In The Blue? is a toe tappin', finger snappin’ mixed bag of garage rock, lounge swing, rockabilly, blues, surf and more. The freedom and looseness involved with having only two instruments allows Dex and Sara to play whatever they want and to shift gears quickly and seamlessly. While that may sound like the results could end up being meandering and unfocused, there’s a surprisingly tight connection between the two. Throughout the album, Sara makes full use of her entire drumset by skillfully weaving the toms into most of her patterns, instead of just relegating them to fills. Dex responds to this foundational creativity as he growls and croons over a flurry of jazzy barre chords and slinky solos. Whether they’re trying to get you to dance or providing a swanky backdrop for your next smooth move, Dex Romweber Duo guarantee to color your night with a mood and music all their own. For my personal tastes, I think Dex shines the brightest in his more manic moments. “Jungle Drums,” “Wish You Would,” “Climb Down,” “Brazil” and “Homicide” all bubble with an excited energy that threatens to jump the tracks at any moment. Warbly vocals spit out through a soulful delivery, fluid rhythms that still match a metronome, complex chords played on a guitar tuned to the key of “close enough”; these contradictions are the real spark of Dex and Sara’s playing. Even when they slow things down for their bossa nova ballads, heartbreak waltzes and kooky instrumentals, the magic remains intact. Just to keep things interesting, they even flavor a few of the tracks with a saxophone and organ. Having seen them live, I can attest that capturing their power onto tape is no small task. There's nothing like the experience of feeling Sara's kick drum in your chest and seeing Dex's cool vibe demeanor give way to the crazed revival preacher. However, Is That You In The Blue? packages everything that's special about Dex and Sara and takes you on a twisting, turning thrill ride of musical emotions. This album promises to spice up any situation and you do not want to miss out on it. Is That You In The Blue? will be released on July 26th on Bloodshot Records.